Heather has pursued a lifelong devotion to human insight, business innovation and helping others realize their full potential to innovate. A seasoned practitioner in Business Design, Heather built a track record of brand and business successes over 25 years in industry through leadership positions at Procter & Gamble, Ogilvy & Mather, and TAXI Advertising & Design. In 2005, she co-founded Rotman DesignWorks, a Strategy Innovation Lab at the University of Toronto. As Executive Director, she cultivated Business Design as a discipline, developed and delivered MBA curriculum, worked with over 3,000 executives in innovation projects and training around the world, and contributed to important publications (including DMI:Review, Rotman Magazine, and other journals) and international conferences. 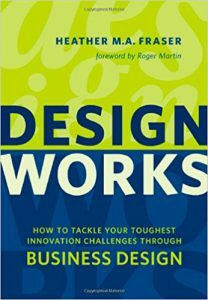 Her pragmatic view of innovation is captured in her book, “Design Works: How to Tackle Your Toughest Business Challenges through Business Design“. Published in 5 languages, her book serves as both textbook in universities and guidebook for practitioners. In 2012, Heather founded Vuka Innovation (VukaInnovation.com) to expand this work beyond the academic realm. Vuka (a Zulu word that means ‘to reawaken and stir into action’) is dedicated to helping organizations unlock their internal capacity to innovate through the application of Business Design principles and practices. She believes that innovation only begins with design thinking, and must be followed through to designing strategy, organizational systems & structures and an agile culture to sustain results. She continues to hold the positions of Adjunct Professor, Researcher, and Business Design Expert in Residence at the Rotman School of Management at the University of Toronto. Heather is also the Founder and Chair of Firefly Foundation (FireflyFoundation.org), a charity dedicated to advancing research on neurodegenerative diseases and supporting the next generation of aspiring neuroscientists in their pursuits.